Propolis is a medicine of the future. Is a natural resinous substance collected together with nectar and pollen and then processed by secretions of bees’ glands, thus forming 60 to 70 different substances, most of them very useful for the human health. 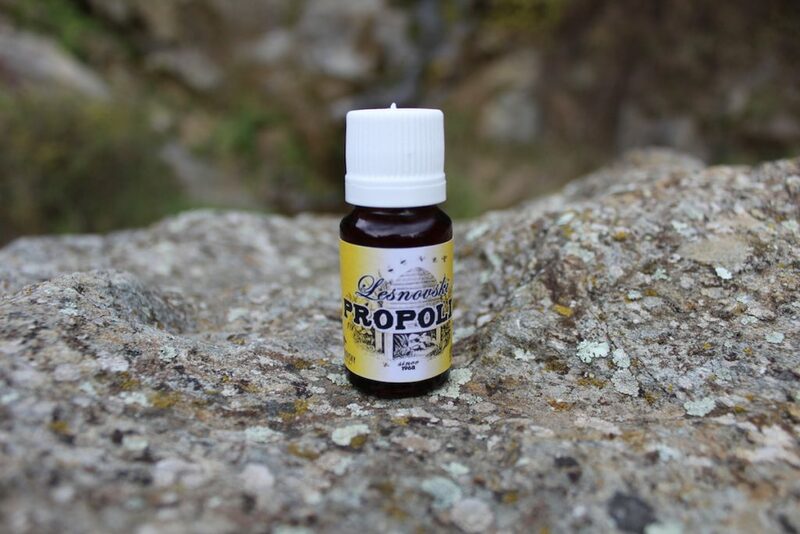 By its chemical composition propolis is a complex mixture of bioflavonoids, pollen, resins, essential oils, amino acids (with nutritional and physiological effect), vitamins, minerals. The main active components of propolis are bioflavonoids (galangin, pinocembrin, hrizin, quercetin, naringenin and apigenin), which have a protective role against external influences on infections. Propolis is known and valued as natural remedy for care and protection of the mouth, oral mucosa and respiratory tract. 20% propolis drops are 20% propolis ethanol extract. Drip 10 to 15 drops on sugar cube or honey teaspoon and take 3 times a day. It can be used to rinse the oral cavity for disinfection and wound care. People have shown interest in using propolis long time ago especially for medicinal purposes in ancient Babylon, Egypt, the Arab world, France, Rome and other countries. Priests, herbalists and healers used propolis and other bee products for preparation of medicines, ointments, balsams for skin diseases and wounds, for mummification of the dead, etc. The founder of medical sciences, Hippocrates, and the philosopher Aristotle used propolis as well. According to ancient sources propolis was used by many scientists and physicians. Among them is the most famous Avicenna (Ibn Sina), Persian philosopher and physician. It is scientifically proven that according to its properties propolis is pure antibiotic, which unlike the other chemical products is non-resistance building and it does not cause any harmful effects in the body. Propolis drops are applied orally and externally. They are recommended for protection of the airways, for increasing immunity, care and protection of the oral cavity mucous membranes and for external use in minor skin damages (various types of eczema, sores, wounds, cuts). It helps in treating gum diseases. It is known that propolis can greatly help diabetics, who due to their reduced immunity are susceptible to fungal and bacterial infections and individuals with impaired circulation with skin changes that often occur. Persons allergic to propolis should not used by propolis drops.